The Historic Centre of Telc is a medieval planned town that has preserved its original layout and the castle-settlement relationship very clearly. The quality of its architecture is high, particularly the Renaissance market place and chateau. The triangular market place possesses great beauty and harmony as well as great cultural importance, surrounded as it is by intact and well preserved Renaissance buildings with a dazzling variety of facades. The historic center of Telč consists of a castle and a triangular marketplace, both of which originate from the Renaissance. Most striking is the series of original houses at the square, built in stone at the end of the 16th century after a fire had destroyed their wooden predecessors. In the 17th century, baroque facades and gables were added to several of them. Not a lot of people from the general travel audience will have heard from Telč. But tourists do come here in large numbers: upon entering the town by car you will be directed to one of the major parking lots around the old center. There are ample parking spaces for buses, and the parking has to be paid for. From the parking it is only a few minutes walk to the city's main attraction: the market square. It is a very elongated square, approximately triangular in shape. On all three sides there is a row of colourful buildings with arcades. They are all in different colours and with various types of gables. The square itself isn’t especially pretty, unlike for example the Grand Place in Brussels or the Piazza San Marco in Venice. Maybe because it isn’t fully enclosed – it opens out to 5 roads. In almost every review of the Telc market square on this website or at Tripadvisor you will read about the eyesore of the place: the center of the square is literally filled with parked cars and larger vehicles, blocking close views of the surrounding buildings. Parking actually has been allowed here only since 10 years or so, one wonders why they have made that decision. It also seems totally unnecessary given the many adjoining streets and parking lots. The view was even more obscured this Saturday by a bunch of haphazardly positioned market stalls, sporting commercial logos. It amazes me that so far no remark about this issue has been made in the State of Conservation reports concerning this WHS. In a far corner of the square lies the “chateau”. This is not a medieval type castle such as in Cesky Krumlov, but a more palatial one dating from the Renaissance and designed under supervision of Italian artists. I wasn’t in the mood for a tour with a tour guide and a large group again (which is the only way to get inside). But the building itself, the courtyard and the garden can be admired for free and are well worth it. I spent about 2 hours in Telč, including time for consuming a hearty and cheap lunch with the locals at the Švejk restaurant. The facades of the buildings aligning the square are indeed beautiful, but I couldn’t really enjoy them because of the obstructed views and the lack of information on display on site. Most of my photographer friends who visited Czechia during the 90 always came back with sets of photos of the iconic old square of Telc, I even become more intrigued with this city after leant that many of my friends from Asia came to Czechia with specific plan to visit Telc, so when I planned to travel around this country, Telc was one of the top five I want to see with high expectation. I travelled from Cesky Krumlov with a short break at Trebon to be arrived at Telc around noon. At first, I walked around Telc’s old city area, it was lovely but nothing particular striking after medieval marvel of Cesky Krumlov. Then I went to see its famous city square, when I approached the square, I knew immediately that this place was really a reason why people come to Telc. The triangular shaped square was indeed really beautiful with stunning building around the square. Each building’s façade was truly a fine example of this kind of architecture. Few of renaissance buildings did make the square to be more interesting than plain baroque one which could be found in other city square in this region, strangely these baroque-renaissance buildings were harmoniously blended into one beautiful single square. I also did visit the nice renaissance castle; however, after walked around the square, I felt something not right. This city maybe beautiful, a must see that truly match my high expectation, but there was nothing apart from the postcard perfect image. It was heavily sterilized for tourism in my opinion, I felt like I visited a theme park not the city where real people live and work. Despite the feeling of emptiness from the visit, I would say that Telc was a beautiful place, fine World Heritage Site and a place that should visit of Czechia. By the way, maybe it was my luck, only few cars on the square, so I did not find those cars to ruin the overall experience. Please find a link below to my latest film, this time from the town of Telc in the Czech Republic, a visit that coincided with their 20th anniversary as a World Heritage Site including market, food and a medieval feast. Visiting Telc was coveniently accomplished as a stopover when travelling by train from Ceske Budejocice and Kutna Hora. 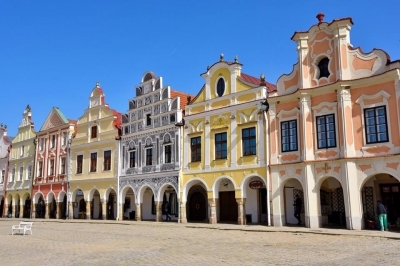 Having seen many historic town squares in Europe, I have to say that the one in Telc is one of the most beautiful. The WH site consists of the main square, the adjacent streets of the old town, the castle and the surrounding fish ponds. The main square is a coherent complex in the form of an elongated triangle. All the well-conserved Baroque and Renaissance houses have high gables and arcades. It was a great pleasure to stroll around the square and under the arcades and to study in detail the sgraffiti and the colourful decoration of the facades. We skipped a guided tour through the interior of the castle, we visited only the courtyard and the nice garden. And we went for a walk in the twilight around the fish ponds, which was wonderful after a rich Czech dinner and a few cold Pilsner beer. We stayed overnight in Telc and rented a room in a private house at the town square (it was really cheap, 15 Euro for one double room). That was a quite good choice, the atmosphere changed in the evening when most of the tourists were gone. The main square was only dimly lit and we felt almost like set back in time - if there were no parked cars. The view from our window in the morning (photo) has finally made ​​Telc a highlight of our trip to Moravia. Telc is small but pretty town nicely located between three fish-ponds. I think that it is an eyewash for tourist, because the main quality of houses on market square stems from their unity and cohesion and not from thier architectonic importance. This is not absolutely true for castle, which represents a landmark of renaissance architecture in central-european region. I have been many times in the town of Telè, a beautiful town founded in the 14th century that was prosperous especially under Zachariáš of Hradec. It has a very small centre on a low hill, encircled by three defensives fishponds (Štěpnický, Ulický and Staroměstský; there are also remains of the stone walls and two decorated gates), and consists only in a stunning huge market square, dedicated in 1990 to Zachariáš of Hradec, in the form of an elongated triangle, and in the surrounding streets. The beautiful porticated Gothic and Renaissance houses on the square are conformed on a standard plan and have nice Baroque or Rococo or classical façades, reconstructed also after a fire in the 19th century, decorated or painted, and all of almost the same height; they were damaged by a war in 1359 and were wooden until a fire in 1386, when were reconstructed in stone, and then in Renaissance style after a second fire. The castle is a big Renaissance masterpiece (originally Gothic, reconstructed in High Gothic style), constructed by Baldassarre Maggi from Arogno. The pentagonal main court has porticated and arcaded aerial passagges; the chapel of All Saints has vaulting with stucco and some tombs. On the ground floor there are four rooms: the Banqeting Hall, with graffiti showing biblical and mytological scenes, the Treasury, with graffiti representing architectonic elements, the Chapel of St. George with ceiling with stucco and walls with relieves, and the Armory, with Gothic vaults. On the first floor there are many rooms. The second and biggest Banqueting Hall, that was also used as theatre, has a stucco, fresco and graffiti decoration, a fireplace and an adjacent studying room with a library; near that are some rooms where are displayed arms, furniture, portraits, ceramics from Faenza and many african hunting trophies that belonged to the last owners of the castle, the family Podstatský. The Hall of the Riders, that was used for the hearings, has a false marble floor, a beautiful painted coffered ceiling, portraits and a nice fireplace. The Golden Hall, that was used for events and balls, has a stunning ceiling, with octagonal coffers with mythological relieves, and a fresco representing also some castles fighting for the inheritance of the family Witkowitz. The Blue Hall has a coffered ceiling and a tapestry and the Small Hall has portraits of emperors on the ceiling, mythological scenes on the walls and displays ceramics from Delft. A starcaise, where is also displayed a Baroque sledge, brings to the nice garden. There are also the church of St. James, that was reconstructed after the fire in 1386 and has two Gothic naves, a tower with a Baroque dome and a Renaissance choir, the church of the Holy Ghost, with a beautiful Romanesque tower, the Baroque jesuitic complex formed by the church of the Name of Jesus, with two towers, and the college and the column of the Virgin. This town is one of the most beautiful places I have ever seen because of the quality of the architecture and of the decorations also of the interiors; it's the most picturesque town in Moravia. It's absolutely worth to be visited (if you go there you must leave the car outside the centre and visit the castle only with a guided tour) and justifies the inscription, even if could be inscribed together with Slavonice, that is currently on the Tentative List. In a country that has plenty of pretty town squares this one has to take the prize for the prettiest. The town centre is small and as said below is little more than a square. It is encircled on three sides by ponds that were used as defensive moats originally and now are used for rowing boats. Most of the houses on the square are gabbled and ornately decorated; many have private rooms to rent, many work out to be quite cheap and offer a great central location. There is a chateaux at one end of the square that has some immaculately kept gardens and a clock tower that gives you a good over view of the whole town. When I visited there was a medieval fair in the main square so there were a lot of tourists. However my friends that visited before me said it was very quiet, and I guess from Rob's quote below that it is most of the time pretty well most tourists itineraries. This may have to do with the fact that it can be quite a hard place to get to; as the train links are very infrequent, only really two trains of any use service it a day. The best way to get here is by bus. It is only 20km along the road from Trebic which is also a WHS and it is a pretty simple trip to make. It is well worth making a trip here as it is one of the prettiest places in Central Europe and a perfect place to spend some time relaxing. Telc is a historic city in the south of the Czech Republic, close to the Austrian border, and one of the country's main tourist attractions. It's really very small, not much more than the main square and the castle (the historic part of the town, anyway), but what there is is very pretty indeed. Since the whole town was rebuilt at the same time after a fire destroyed the old wooden buildings, the city boasts a rare architectural unity and cohesion. Most of the buildings are in Renaissance style, another rarity in a region full of Baroque buildings. Together with Prague and Cesky Krumlov, this place should be on any traveler's list of things to see in the Czech Republic. Telc is a wonderful place to spend a day or so. It isn't a large site - really nothing more than a town square, but that square is well worth it's place on the list. The facades of the buildings are in excellent condition and are some of the most beautiful in the Czech Republic. It is also relatively free of tourists. 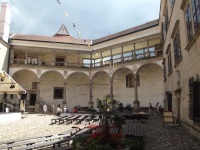 A visit to Telc is recommended. Legends and Folk Myths: Within the [castel's] chapel in a white marble sarcophagus lie the remains of Zacharias z Hradec and his wife Katharina Valdstejn. According to legend, the young wife was implicated in her own death. She allowed her portrait to be painted while she was pregnant - despite warnings that this meant she would die within a year of her birth. Built in the 14th century: As a planned settlement of the Later Middle Ages: "The town itself was probably founded in the mid 14th century". (AB ev). A fire in 1386 lead to reconstruction of the buildings in stone. 182 Community Members have visited.